Description: This Master Edition is a giclee reproduction from an original painting by Cape Cod artist Timothy Jon Struna and the edition is limited to 200. It is also available with a Remarque, which is an original pencil drawing highlighting a related detail to the image and drawn in the bottom left margin by the artist. (See options.) 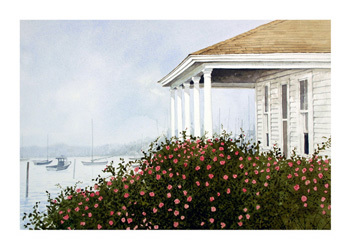 "Harbor Roses" captures the essence of a foggy morning near Chatham and its coastline.